IMCDb.org: BSA A10 Avon Streamliner in "Allez France!, 1964"
The bike is impossible to pick with that fairing. 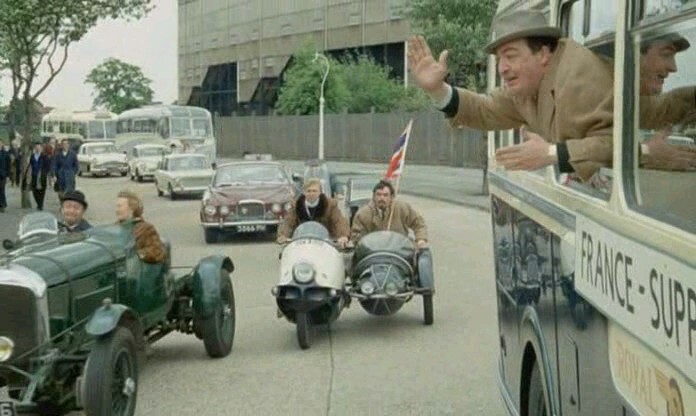 The cars are easy - hot rod Bentley (the radiator looks odd - maybe it is a 4 litre) on the left, followed by Mk10 Jag, Austin 1100, Morris Minor and Mark2 Zephyr. The coach next to Zephyr is a Duple Elizabethan followed by another Royal Blue Bristol MW/ECW. The bie is a BSA A10 with Avon Streamliner body.